Grangeville bed and breakfast travel guide for romantic, historic and adventure b&b's. 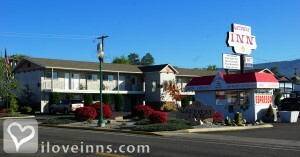 Browse through the iLoveInns.com database of Grangeville, Idaho bed and breakfasts and country inns to find detailed listings that include room rates, special deals and area activities. You can click on the 'check rates and availability' button to contact the innkeeper. Grangeville, Idaho offers visitors fishing, kayaking, or canoeing, on one of the many rivers such as Salmon, Clearwater, Snake, Selway, and Lochsa. Hiking along the Nez Perce Historical Trail is another great opportunity to combine fitness and enjoying nature. For skiers, Snowhaven Ski Resort is one of the best skiing spots in the state. Eimers Park in Grangeville is where the replica of one of the mammoths found in Tolo Lake is located. The Bicentennial Historical Museum and Albion Museum are of interest. rangeville bed and breakfast inns can provide more ideas for activities. By Evergreen Suites. Idaho's Oldest Rodeo - 3 days of Parades and Rodeos, Whitewater Rafting on the Salmon River- the River of no Return, Golfing at Grangeville Golf and Country Club, Fishing on the Clearwater- Salmon, Lochsa and Snake Rivers for Steelhead, Salmon and Sturgeon, Hunting for Elk and Whitetail deer- Mule deer- Bear - Wolves - Cougar- moose and much more, Crosscountry skiing -Skiing and Snowboarding at Snowhaven Ski area. Tubing on the longest and highest tube hill in the Northwest!! Snowmobile just 7 miles from town and over look the great Camas Praire from the top of the mountain! By Gateway Inn.